America was the underdog for over 20 years, till ending their long losing streak in 2016 when USA beat their rivals, Europe, 17-11. This was just the second time this century that America took home the Ryder Cup. With eight European victories in the previous 10 Ryder Cups, can USA do it again? European captain Thomas Bjorn had a lot of complicated decisions to make in picking for the European team and if Europe fails to win on home soil for the first time in 25 years when the two sides compete for the cherished cup Sept. 28-30 at Le Golf National outside of Paris, you better believe Bjorn surely will be subject to second-guessing for his captain’s picks. Outside of Phil Mickelson, no player has made more starts in Ryder Cup play for the U.S. than Furyk. An astounding 9 times compiling a 10-20-4 record. The 17-time PGA Tour winner is also the first player to shoot 58 in a PGA Tour event. Davis Love III is veteran of six Ryder Cups as a player. Love also served as an assistant captain to Corey Pavin in the 2010 Ryder Cup and was the Captain for the 2012 matches. Love, the 1997 PGA Champion, is a 21-time winner on the PGA Tour. A 12-time winner on the PGA Tour, Steve Stricker has made three appearances for the U.S. in the Ryder Cup. Stricker joined the PGA Tour Champions in 2017 and won the 2018 Cologuard Classic and the Rapiscan Systems Classic. Winner of 79 events on the PGA Tour, including 14 majors and 7 Ryder Cups. His was Vice Captain under Davis Love III at Hazeltine, winning 17-11. He’s made an incredible return in 2018 with a T2 finish at the Valspar Championship and finished T6 or better in this season’s final two majors. 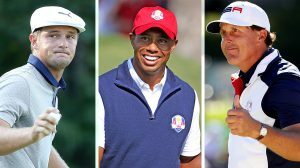 Three of the eight automatic qualifiers for the 2018 U.S. Ryder Cup team rank among the youngest Americans ever to make their debut in the Ryder Cup, so you could make the case that the U.S. is in a golden age in golf. Jordan Spieth and Rickie Fowler were 21 years old when they first represented the U.S. and Patrick Reed was 24. Tiger Woods, who’s among the most discussed candidates for Captain Jim Furyk’s four captain’s picks, was also 21 when he made his Ryder Cup debut. The Ryder Cup has become one of the world’s greatest sporting events since debuting in 1927. Every two years (even numbered), 24 of the best players (12 from Europe and 12 from US) go head-to-head in match play competition. It consists of five match-play sessions played over three days. The European Team will comprise the first 4 players from the European Points List, followed by the leading 4 players from the World Points List and completed by 4 wild cards. The US Team will be made up from the top 8 in the points rankings at the end of the 2018 PGA Championship with 4 captain’s picks. 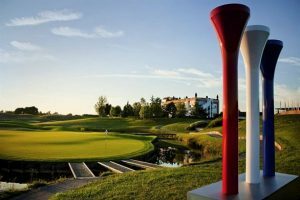 Le Golf National has hosted the Open de France 26 times in its 28-year history, but it has never seen as big a spotlight as it will with the 2018 Ryder Cup. Players will want to impress on the first tee, but you can’t be overly aggressive. The water comes into play very quickly about 80 yards from the green. Players will impress more with their second shot than they will with their first. After the 1937 Ryder Cup, the matches weren’t contested again until 1947 due to World War II. From 1927 to 1959, the Ryder Cup consisted of just two sessions — one foursomes and one singles. In 1961, the matches entailed two fourballs and two singles sessions. In 1963, the matches consisted of two foursomes, two fourballs and two singles sessions. Ireland joined Great Britain and Ireland for the first time in 1973. The 1977 matches had one foursomes, one fourballs and one singles session. 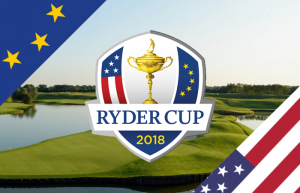 In 1979 the Ryder Cup had two foursomes, two fourballs and two singles sessions and was also the first year that all of continental Europe was included. It wasn’t until 1981 that the format we know today — two foursomes, two fourballs and one singles session — came to be. The 2002 Ryder Cup at the Belfry, won by Europe, was supposed to be played in 2001, but was postponed one year due to the events of 9/11.